What a journey! The culmination of nearly 7 years fund raising… Looking back on our projects renovations and donations we think of the lives we have managed to touch through the kind support of all our sponsors and the hard voluntary work put in by the One Life Charity team over the years! The truck arrived early (auspicious!) 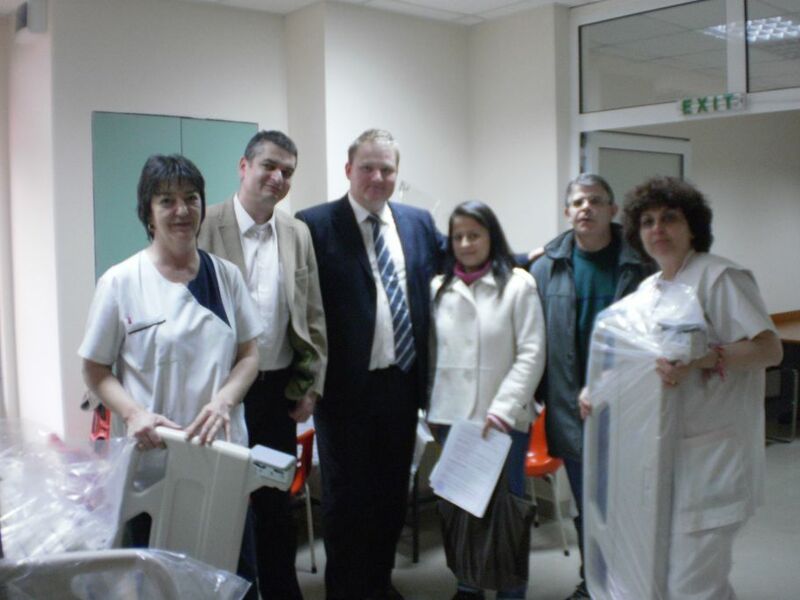 a rare event in Bulgaria with the 15 beds and mattresses being unloaded representatives of the team Chairman Slavi Christov, Directors Carl Smith & James Flint along with Mimi in support were welcomed with open arms by the dedicated hospital staff. It was great to see that our beds were the a sorely needed finishing touch as though EU funds have spruced up the kids ward no end with new toilets and shiny polished granito gres flooring there old beds still stood out as a sore thumb, a relic of a utilitarian past when life had a more collective asense in the totalitarian past! Most of us probably cast our mind’s eye back to the Infectious Diseases Hospital here in Sofia where we did our first renovation and the Dickensian conditions that existed at that time for kids unfortunate enough to get ill in Bulgaria! Nowadays every life is important and none more so than the little girl we met at the ward her father brimming with gratitude after waiting 9 years for a liver transplant in Germany his daughter now under observation on her return to Bulgaria getting new comfortable beds courtesy of One Life Charity. It was so touching moment and gave us all the emotional connect between our hard days of event organising whether it be for the rugby event, football tournaments, cricket golf cycling or the Pub Quizzes it all somehow made sense to us know and we knew we had come full circle and delivered aid as promised at point of most need to those kids suffering from life threatening illness as we set out to do all those years back! Watch this space for more life improving and saving donations from One Life Charity and for our updates on the 4th annual CHUWA convoy delivering aid to Bulgarian orphanages in the Stara Zagora region with more promised in September it will be a busy and successful year for our small but dedicated charity.